Terms and Conditions The Global Hotel Card is issued by Global Hotel Card, Inc. and is subject to the following terms and conditions that may be revised at any time. The website is independently owned and operated by Global Hotel Card, Inc. The Hotel inventory on the website is supplied by EAN (Expedia Affiliate Network) a division within the Expedia, Inc. Group, one of the world’s largest travel companies, and trademarks are the property of EAN Worldwide, LLC and are used by license. 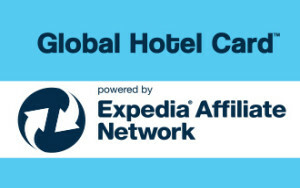 Use of the www.globalhotelcard.com website and the Global Hotel Card constitutes Global Hotel Cards can be used and redeemed ONLY FOR HOTEL RESERVATIONS MADE ONLINE through the www.globalhotelcard.com website, not redeemable at Expedia.com or at the hotel directly. Hotel availability is not guaranteed. If the hotel reservation price is less than the value of the Card (s), the remaining portion will be available for a future reservation. If the reservation price is greater than the value of the card(s), the difference must be paid with a credit card at the time of booking. All reservations require a major credit card to complete the reservation. Must be 18 years of age or older. Up to four (4) cards may be redeemed per reservation. Some Promotional Cards may be limited to one card per booking. You may cancel your reservation with no penalty IF the cancellation is done online at www.globalhotelcard.com and is within the rules of the HOTEL’s cancellation policy. The value of your Gift Card (subject to any Penalties) will be immediate when you cancel online at www.globalhotelcard.com and payment on your credit card will be reinstated within 5-7 business days of confirmation that the reservation was cancelled within the rules of the hotel’s policy and there are no penalties. After choosing your hotel reservation, you will be asked to enter your 19-digit Gift Card Promotion Code. Simply apply the value of your Global Hotel Card for full or partial payment of the hotel reservation. The balance, if necessary may be paid with a major credit card. You may use a maximum of four codes per reservation. Some promotional codes are limited to one code per reservation. Please check the terms of the booking carefully before you complete the reservation and accept the terms.